My name is Jennifer. My husband and I just bought our first house and I want to start a garden. I have never gardened in a yard by myself; I have assisted my dad when I lived at my parent’s house years ago. I think I have a good idea of what I want but am not quite sure if I going about it the correct way. There is not garden pictures, or bed pictures to show. Right now my yard is covered in about a foot and a half of snow! Questions: Am I planting plants next to compatible plants? Am I leaving enough room to work around? Is this plan an easy garden to start with? Any changes or recommendations? If you plant those peppers together you might wind up with some kind of hybrid, they will mix pollinate each other and produce a hybrid. 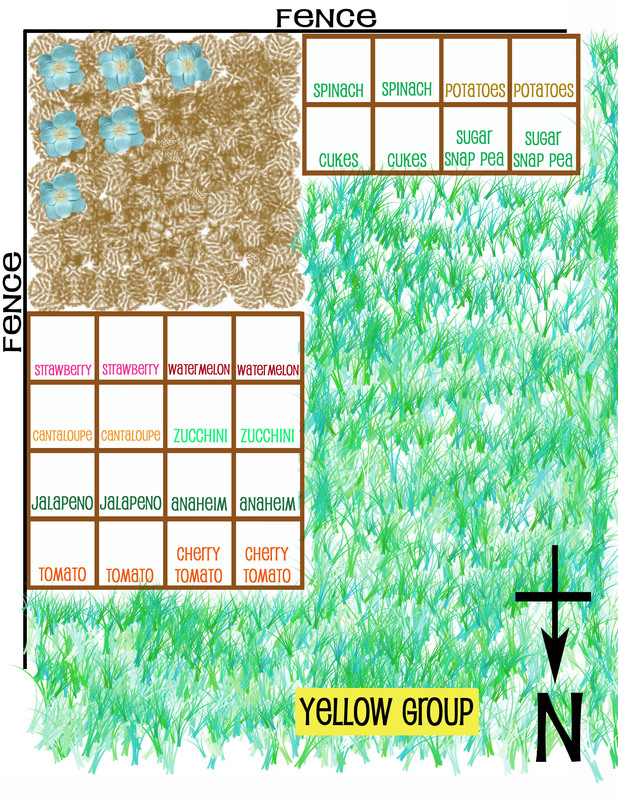 For the tomatoes, figure out what kind you’ll be growing to determine the space they’ll need. “Determinate” tomatoes are smaller and more manageable — they get to a certain size and bear all the fruit over a fairly short period (useful for canning/freezing/saucing); these can do fine in one square as long as you have a tomato cage to support the vines. “Indeterminate” tomatoes bear fruit all season. But they also keep growing all season, so many of them can get really big; you’ll definitely need to provide a large support for them or doing a lot of pruning. And finally, unless you’ll be growing snap peas both spring and fall, you might be able to combine those squares with something else to free up space for something else. For example, you could grow snap peas in the spring, then plant the cukes on the same trellis after they’re done. Hi Jennifer, I’d personally recommend two 4×3 beds instead of the 4×4 bed – I’ve found it’s too far to reach comfortably. Thanks for the feedback! Our fences are privacy fences, six foot vinyl fences. The only reason that I wanted to plant in that southeast corner is that the previous owners had a planting bed in that corner and I was hoping to plant in the existing footprint. Also, along the southwest corner are three trees. Congrats on your new home! I would like to start with a question: is the fence chain link or privacy (will cast a shadow when the sun is shining)? If it’s a solid, privacy fence, you may want to consider other locations because your garden may not receive the 8-12 hrs of sun it will desire each day. Those fences are on the east and south sides, correct? If the layout of your yard allows it, I would consider using the north and west sides – more sun. Is the 4×4 box accessible from the strawberry side in the corner garden? If it is, you should be able to access each square of the box. If not, you may want to reduce the size of the box so you can reach each square (2 foot reach from any side). When planning and eventually planting, consider the full-growth size of the plants. Strawberries will stay low to the ground and spread, while cantelope (a vine) will go everywhere (consider growing it up a trellis of some sort). The watermelon (can also be grown up a trellis) and squash can/will grow large, as will the tomatoes. From my experience, 2-4 squares have been needed for tomato plants as well as zucchini. I hope that helps…. and that I haven’t discouraged you. I remember my first year; the final plan didn’t look anything like the first one! Search this site, esp here: http://www.mysquarefootgarden.net/create-garden-plan/ It has lots more detail for planning. And if you can get the book on Square Foot Gardening, it will help lots too. It has spacing charts as well as planting timeframes.